There are two versions of this guitar, Signature I & Signature III. There is no Dan Armstrong II model. …and a rare Westone prototype model which never went into full production (about 100 or less were assembled). 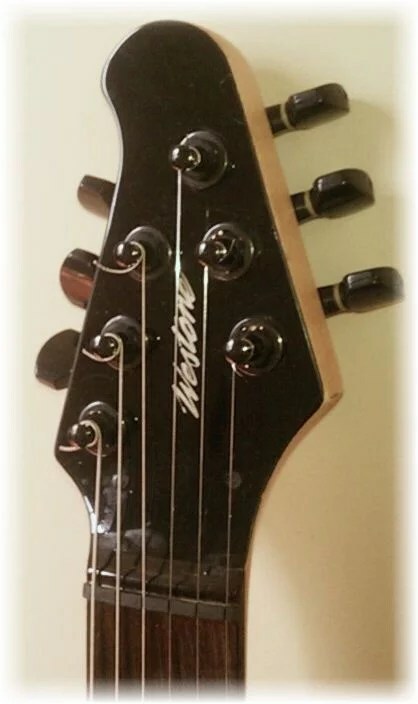 This is the 2nd headstock design. Originally the headstock was sort of like a Fender mandolin,with a 4+2 tuner configuration. We told Dan it was too much like a Fender but he wasn’t too concerned about it. When the model debuted at the NAMM show Ernie Ball claimed a copyrght on the 4+2 headstock(despite Gretsch and others having produced such a design both before and since). This caused a cessation of production. Despite the new design for a 3+3 configuration the project was ultimately scrapped. 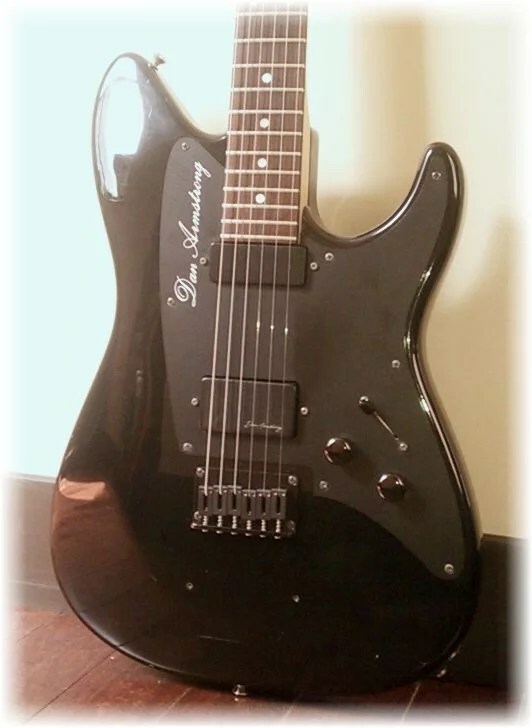 Among the unique features are humbucking pickups of Dan’Zzs own design which he patented (note that they are of different sizes), and a 23 fret fingerboard (essential to Dans phlosophy of the rythym PU poles being right at the harmonic point of the 24th fret octave); also a unique upper bout crested contoured body shape ( a couple of years after this, St. Louis Music made guitars using the remaining bodies but they were not countoured and so didn’t look very good). This guitar is wonderful with a variety of unique tones both single and double coil . The black model shows the 4+2 headstock design, the white one has the revised 3+3 headstock. The following pictures and Demo Video courtesy of Forum member notnumber.